Soon after learning Linux a few months later, I was motivated to rewrite the site in pure HTML, by hand. From there I added a picture gallery, source code, blog, and so on. I continue to post to the blog, but things like GitHub, Twitter, Facebook, etc. provide similar capabilities without the hosting maintenance/hassle. Anyways, I’ve posted it at http://kralidis.ca/misc/firstwebsite/ — enjoy! Do you have your first website? Still online? Feel free to share memories and experiences! Geospatial Catalogues: the saga continues. I have dug deeper into this area this year as part of my day-job, and find that interoperability is difficult to achieve in the OGC Catalogue space. Clearly there is a balance between abstraction/flexibility and ease of integration. And the two step approach to discovering, say, OGC WMS layers (invoke GetRecords, then chain to GetRecordById) is cumbersome, IMHO. At the end of the day, the most common use cases (that I have seen) are publishing data and services, and being able to query for them (data, service endpoints, service resources [layers/feature types/coverages]) with spatial, temporal or aspatial predicates. And have the content come back in some usable format for display or binding. Seems easy, eh? Python fun again: it’s been fun contributing to owslib for SOS, OWS and Filter support. OWS Common presents a huge opportunity to abstract codebase when it comes to next generation OGC standards. As well, I’ve been using Python for day-to-day scripts. Not bad! 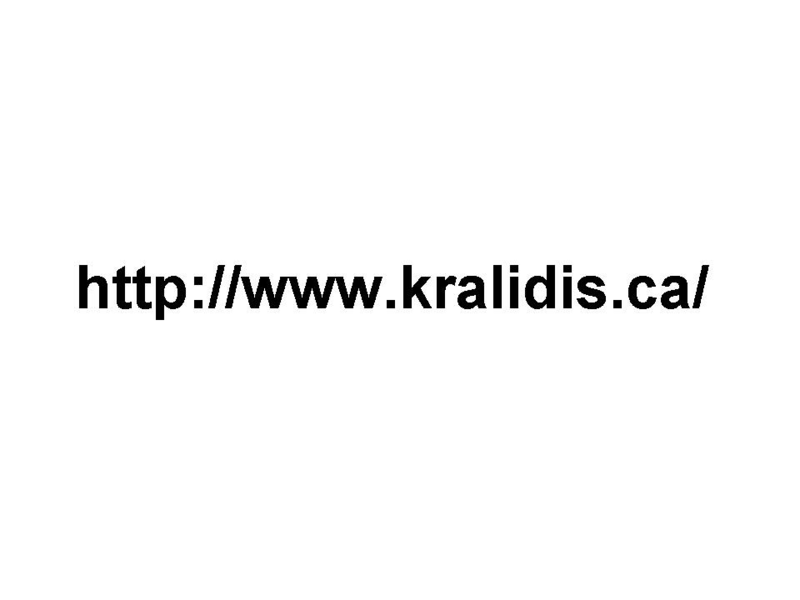 kralidis.ca turns 10: from humble beginnings, alot less done by hand now, and easier to manage (thanks WordPress!). Basement renovation: this took up most of my time this past year. Frustrating, expensive (I should have been a plumber or electrician! ), but gratifying. Took a bit longer than expected, and still not 100% finished, but the major work is done. I think this needed to happen for the property overall, even if it means I have more space than I could possibly need :). N.B. if you ever want to lose weight, do a home reno; I shed 20lbs! Data dissemination: this is my key function in my day job for the months to come. I look forward to evolving what started off as a very high level strategy into an architecture all the way to implementation. This will be fun! Standing up usable catalogues: you’ll see a few OGC Cat2.0 instances this year. Property: I think it will be a good time to buy in 2009. The question (for me) is where. Locally, or down south? All the best for 2009 for you and your loved ones! I embarked on a Google search to find information about Polygon statistics, and low and behold, I posted this on my website years ago. I needed to do some pre-processing of some data which involved transposing column names to values. The condition was that the value for each respective column (frequency count) had to be > 1. My input was a csv file, and my goal was an output csv file which would feed into a batch database import process. The other interesting bit was that only a range of columns applied to the condition; the other columns represented ancillary data. That’s my hack for the day. Have a good weekend! UPDATE: ah, the csv module has a .next() method, which can be used instead of the shoemaker attempt I made above to regularize / split / store the header list. Geospatial Catalogues: I blogged about this last year. Even with Cat 2.0 CSW / ebRIM formally approve, where is catalogue interoperability? Is a federated / distributed catalogue approach realistic in the near future? MapServer: I look forward to continuing in helping more with OGC support, as well as become more familiar with the inner workings of the codebase. I’m renovating my basement this year. Gutting the entire basement and installing a new bathroom and kitchen. I hope to have this done by summer 2008 — wish me luck! So that’s it from here. I wish you and your loved ones the very best in the holiday season and for 2008! Web 2.0, Time article and information overload: Such a good article. And so true. As a result, we are overloaded with information! At one point, I refactored all my bookmarks to be pure RSS feeds just to handle it all. Whoever said computers would lessen the workload!? foss4g2006: This was a great conference. The lighthing talks, BOF sessions, and demo fest, as well the gathering of the OSGeo crowd further solidified OSGeo’s existence. Can’t wait until next year’s event! Atlas of Canada 100th Anniversary: Congratulations on the 100th anniversary of this valuable Canadian resource. Kudos to the Atlas! Condo putters along: construction continued on my condo, and is now ahead of schedule, ready this coming June. Looking good! Website changes: This year, I finally succumbed to using software packages to manage my website content. This website originated in 1998, as an HTML learning experience, so I was inclined to do *everything* by hand. While very useful, as time goes on, I find myself with less and less time (go figure! ), and there’s so many solid tools out there to make things easy, and standards based (i.e XHTML, CSS, etc.). So why not use these great tools and concentrate more on the stuff you want to do, right? Further OWS Common support in MapServer: mapowscommon.c/h is almost complete to spec (missing some operations support). The next step will be to begin integrating into the OGC specs as they migrate to OWS Common for stuff like GetCapabilities XML, etc. OWSContext: look for further formal development on this specification. OWSContext has been used frequently in the OGC testbeds, and interest is increasing in seeing the spec push forward. MapServer Brazil: I was honoured to be invited to this event, and look forward to speaking on OGC and open standards. Looking forward to this! Did I miss anything? What else was geospatial-worthy in 2006? At any rate, this closes out 2006 for me in the blogosphere. I wish everyone a great Holiday season, and all the best for 2007! OK, so I’ve finally started a blog. I’ve been meaning to do this for the longest time, but between house renovations, trying to figure out whether to use a hosted blog or host my own, this fell off my radar screen. Until my cousin started his own, then I just had to put one up. So anyways, here I am. The rest of my website will remain and develop in the same way. I’ll use this blog to post my thoughts and random stuff from time to time. I’m a do-it-yourself kind of guy, but using blog software makes things really easy. Plus maintaing my old RSS feed by hand was becoming, well, cumbersome 🙂 So here we go! Paul’s Professional Education Training Website Now Online! I made a website for my friend Paul. Pretty neat in that it’s pure web standards based, and a few cool tricks under the hood. He likes it too 🙂 Check it out! My form email and text messaging stuff is back online and working properly — message away!! The views expressed here are my own and do not necessarily reflect the views of my employer.